Diner Dash: Grilling Green for iPad is an inventive take on the long-lived Diner Dash franchise, which started life as a Web and download game back in 2003. Playfirst's iPad adaptation looks right at home on the device, with a few multi-touch flourishes that really shine. Things look calm now, but wait until people are lining at the door, the food is late, and your customers get restless. If you’re unfamiliar with the Diner Dash series—which includes more than 30 games—here’s a quick primer: You’re cast as Flo, a harried, hard-working waitress. Your job is to get customers seated, fed, and out the restaurant again as efficiently as possible; the happier you keep your customers, the more money you make, and the more you can upgrade your diner. On other platforms, the gameplay tended to include a lot of mousing around. To tell Flo what to do, you click on patrons to drag them to tables big enough to accomodate them, you click on their tables to take their orders, you click on the kitchen to drop their orders off, and so on. On the iPad, though, all that mousing necessarily becomes a series of taps instead, which is actually a far better fit for the game. Grilling Green includes clever standard gameplay elements from the Diner Dash series, like the ability to combine multiple orders for the same dish so that Grandma (the cook) can prepare them faster. But the game also sports some unique interactions that wouldn’t be possible without the iPad. You can help Grandma cook food by pressing down on cooking hamburgers, chopping vegetables, or stirring pots, all via intuitive touch gestures. Before I play a new game, I always tend to read the manual or help screens, if available. (I think that puts me in the minority of game players, but I digress.) Grilling Green included more than a dozen help screens outlining all sorts of gameplay rules, and I started to feel antsy. My angst, however, was unnecessary; the game does a terrific job of explaining newly acquired stuff (the hostess podium, the Touch Cooker 3000) and how to use them, as they’re introduced. Diner Dash escalates the challenges quite well over time, too. As soon as you start to feel good at the game, new wrinkles are introduced: more foods to prepare, business executives who need to be seated and served faster, larger parties—all of them serve to make the game more taxing. Diner Dash looks great on the iPad. The game lets you play in any orientation, and even lets you move the Touch Cooker interface wherever you’d like. Defying the laws of physics, you can actually guide customers to their seats while you simultaneously cook with the Touch Cooker 3000 and serve your customers, if your fingers are agile enough. The soundtrack sounds fine, but is painfully repetitive. If you’ve enjoyed earlier incarnations of Diner Dash, I have no doubt you’ll similarly enjoy it on the iPad. Newcomers, though, should take note: Grilling Green is a fun and well-implemented strategy game, but it can also be a bit stressful. 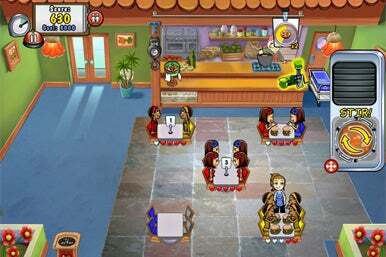 Not unlike a real diner, perhaps, Diner Dash features a ceaseless parade of customers fighting for your attention. The game quickly adopts a relentlessly frenetic pace and doesn’t let up. To some, that might sound more like work than play. But for the rest of us, Diner Dash: Grilling Green is a superbly-executed iPad game.